My schedule is such that on teaching days I feel as though I rush from my house to the teachers’ room and from there to the classroom and from there back home in the evening. I sometimes feel as though I barely have time for getting through all the marking, let alone for reflecting on my teaching. Yet, somehow, reflection does happen. At the most basic level, there is rarely a lesson I walk out of without thinking either (a) “Well that went well.” Or (b) “That didn’t go so well.” Or (c) “I think I’d do that differently next time.” Very often it is a passing thought that I file away for future reference as I rush on to the next lesson or the next thing and sometimes I come back to it later and other times I don’t. What went well in the lesson? What didn’t go so well in the lesson? These are simple questions, but they are the ones I return to most often as I find they help to remind me that just because a lesson went badly doesn’t mean there weren’t any positives and of course vice versa, and because they are constructive. They don’t dwell on the negative but they help me to think about how a different approach would yield different results. Possibly the one thing that helps me reflect most effectively is writing about it. Jeremy Harmer (2007: 411) suggests keeping a journal or a reflective diary, though I suspect the more modern equivalent is writing a blog, which is my approach. Not everything I write about is a reflection on my own personal practice, some of it is a comment on ideas, theories and practices put forward by others, some of it is a reflection or exploration of reading that I have been doing. I do, however, use it to occasionally share my classroom successes and failures and I have found that writing lends itself to a more considered, reflective view of events than speaking, which is often emotional and caught up in the minutae of events rather than seeing the bigger themes at play. I prefer the blog to the journal for a number of reasons. Journals are, by their nature, very personal, very private and deeply introspective. We use them to write down not only what happened, but what we think and feel about the events. These are the strengths of the journal, because it allows us to write whatever we like, without fear or favour and without having to concern ourselves with what other people might think about us or worrying about judgement on our teaching. It is this secrecy though, that I think is also the biggest weakness of the journal as there is no counter-acting voice. There is always a risk in reflection that we get too caught up in our own thinking about events and end up focusing on our thinking rather than on the events themselves. Other people can help keep you honest and to view things with a degree of professional detachment by focusing on the practical – as well as lending you some emotional support as necessary! This is where blogs, I feel, have the advantage. Immediately, you are writing for an audience and therefore your writing will be clearer, more considered and more focused. The audience is also in a position to respond and often does so by sharing stories of when they have been in similar situations and what they did about it, or by providing useful advice learnt from their experience. People read your ideas and share their experiences of trying them out or suggest variations on your procedures. Where you feel you might be judged on what you write, you can make your blog anonymous and still get the kind of feedback you need. In all this though, it is important to remember that reflection is not much use if it doesn’t lead to change. 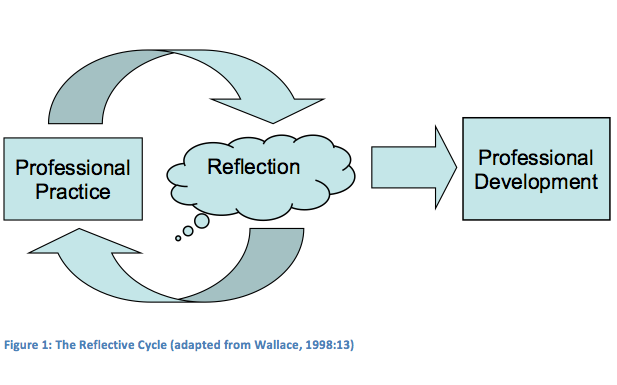 Michael Wallace (1998: 13) provides a diagram of the reflective cycle which shows how reflection comes from professional practice, but also leads back to it as the changes we make to our practice arise from the reflection. The result of this process is our professional development. This then, is the third way in which I reflect on my teaching – through experimenting with change. There is a certain anxiety in moving away from processes and procedures that you are familiar and happy with, but there is no harm in seeing what happens if you try something different. This year I have been experimenting with the seating plans for the first time. I had previously resisted using seating plans because I associate them with my own education and have always felt that I wasn’t THAT kind of teacher. Apparently though, I am that kind of teacher and have had great success rearranging my classes for more effective classroom management! There is a kind of mini action research cycle going on here, where you identify a problem, design an intervention to solve that problem, implement it and then reflect on the success (or failure!) of that intervention. I wouldn’t call it a “full” action research cycle, because there are a number of other things in action research that this leaves out, but it is a useful way of looking at our teaching because it forces us to focus in on one particular area and not to get caught up in the general maelstrom of the lesson. If you have any strategies or processes you use to reflect on your own teaching, please share them in the comments section below! Harmer, J. (2007). The practice of English language teaching. Harlow, England: Pearson Longman. For me the reflection is one of the most important feedback that learners should know how progressive they are in learning their language. One thing I always do as long as my teaching is marking the exercises after each grammar lesson after class in the evening or perhaps at night time. When I come back to the class, I give back their exercise notebooks and have them look at the mistake happened in each learner. Have them ask the questions what they don't understand and why they did the mistake. Let each learner help answer the questions if they can then let them correct the exercises again until they all understand well in each lesson. Article by David Petrie on professional development. One of the best article on professional development.It also focus on Reflections and advantages of blogs.